This shop has now closed down. Cheesemonger Beillevaire has been producing some of the best French cheeses for 30 years. And they are still enthusiasts about making you discover their products. With a wide range of traditional cheeses prepared by passionate women and men, they serve their products and customers. They produce cheeses and yoghurt, butter, cream....And they are the only ones to do that in London ! You can also enjoy the delicous raclette, cheese plate and mont d'or directly in the shop! Where is your shop in London now. It is no longer in Montpelier St. Thanks. Brilliant cheese, Fabrice the guy behind the counter couldnt be more helpful!! Five stars is not enough! 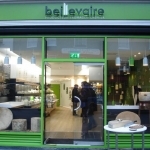 Cheese being a great source of pleasure, BEILLEVAIRE is an address I go to regularly to provide myself with not only cheese but a wide range of other products (yoghourts, milk, fromage blanc, creme fraiche,fresh eggs, pain d'epice, jam and pasta). The staff gladly share their knowledge and the whole shopping experience is just how I like it : quality and all smiles. Fantastic staff, friendly service and amazing for lovers of cheese and wine. This is definitely a new favourite of mine. Great service, friendly staff...and as for the selection of cheese..! A real family run gem that's well worth a visit.